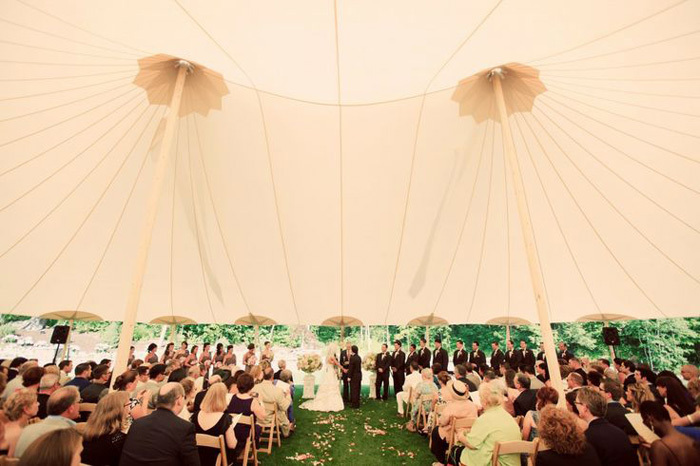 So you’ve decided on an outdoor tented wedding, but what kind of tent will you select? 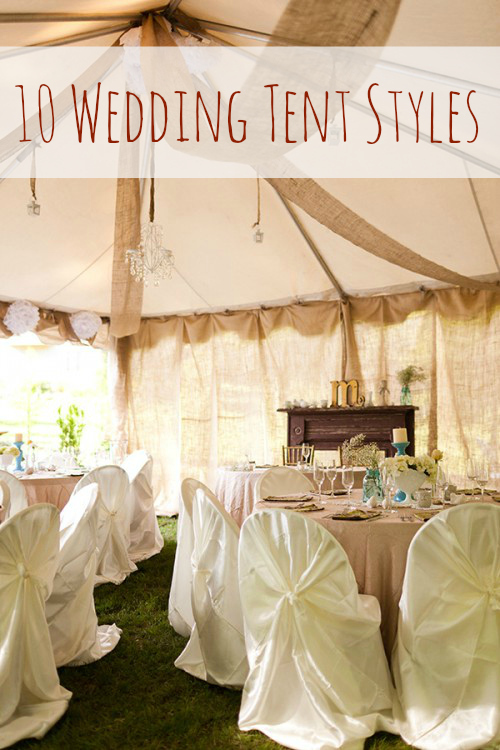 It used to be that there was only one or two tent styles to choose from, making the choice relatively easy. These days, however, there are many more options available making things a little more confusing. To help you with your decision, we’ve rounded up 10 of the different types of tents available for your big day, from the traditional to the truly unique. 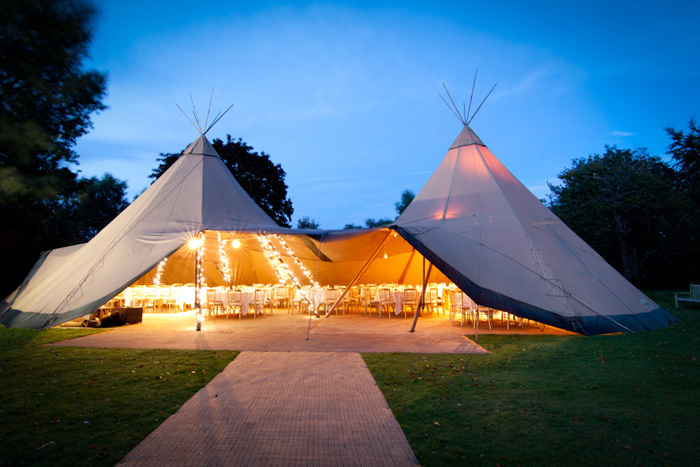 The pole tent, as its name suggests, is supported by poles and guy-wires and has a big showy top with one or more peaks. Beautiful and elegant, it is a truly sophisticated choice. Since pole tents must be staked into the ground, however, they cannot be set up on concrete or other hard surfaces, making them less versatile than some other types of tents. 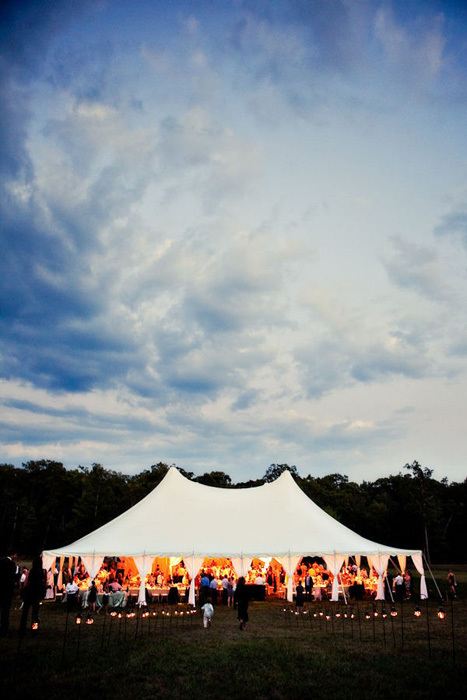 The frame tent is one of the most common types of party tent out there. Instead of poles, it uses a metal frame to support the tent and is free standing so it can be set up on most solid surfaces. While it may not be as beautiful as the pole tent, it is more versatile. Inside the tent, the metal pipes are exposed and can left as they are to hang lights and decorations, or hidden with layers of draped fabric. 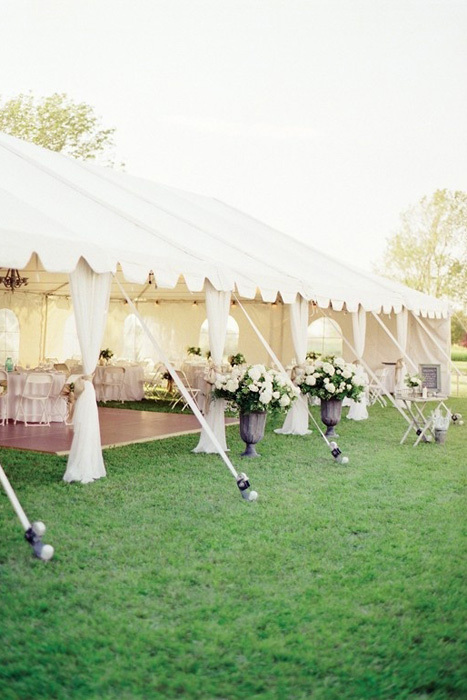 The marquee tent is a cross between the pole tent and the frame tent. It combines the convenience of the freestanding metal frame tent with the aesthetic of the pole tent’s peaked roof, giving you the best of both worlds. 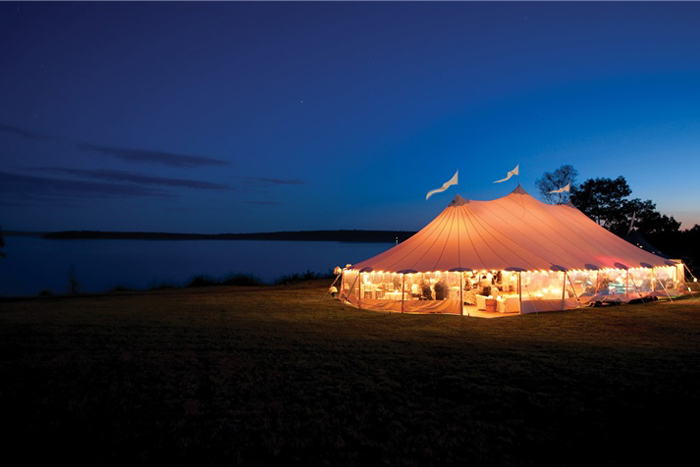 An increasingly popular choice, the sailcloth tent is a type of pole tent that uses sailcloth material rather than vinyl, and wooden poles to support it. 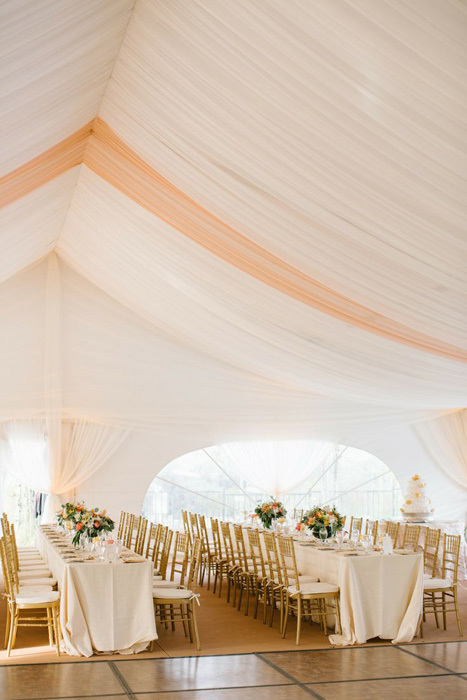 The translucent fabric adds a beautiful glow to the interior space of the tent, and the soaring ceiling and curved lines make it a beautiful choice for any occasion. Like the pole tent, however, it requires extensive staking with guy-wires to support it and is not suitable for all surfaces. The clear tent is a frame based tent with a clear vinyl top. 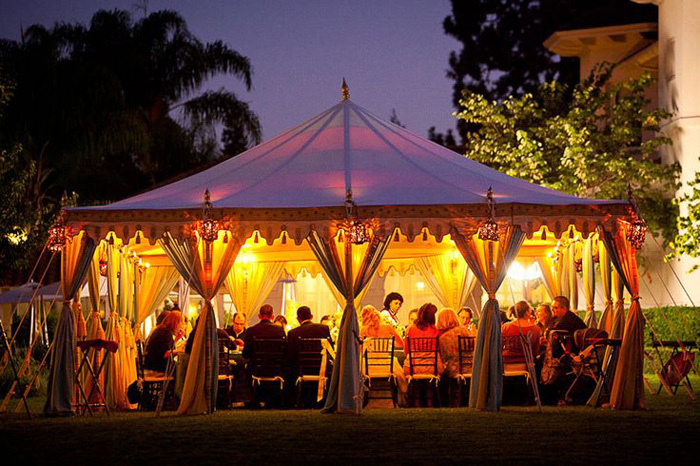 With this type of tent, you can dine and dance under the stars with the added bonus of being protected from the weather; perfect for those that don’t want a tent in the first place, but are too practical not to get one. 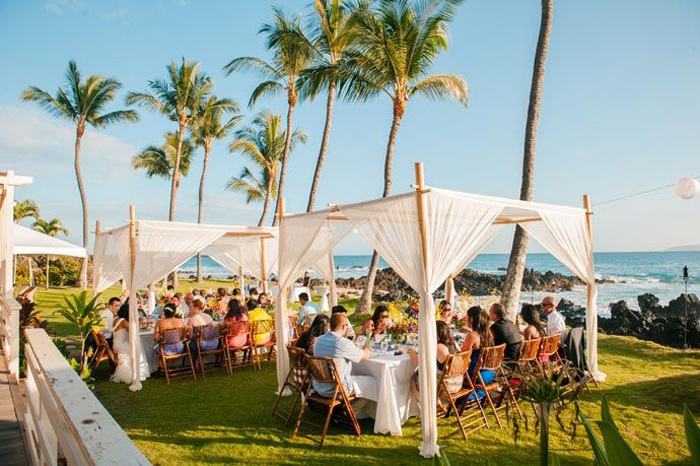 The beach or tropical style tent varies in style, but generally consists of light translucent fabric draped over a wooden or bamboo frame of some sort. The purpose of this type of tent is almost entirely aesthetics as it provides little to no protection from the elements. 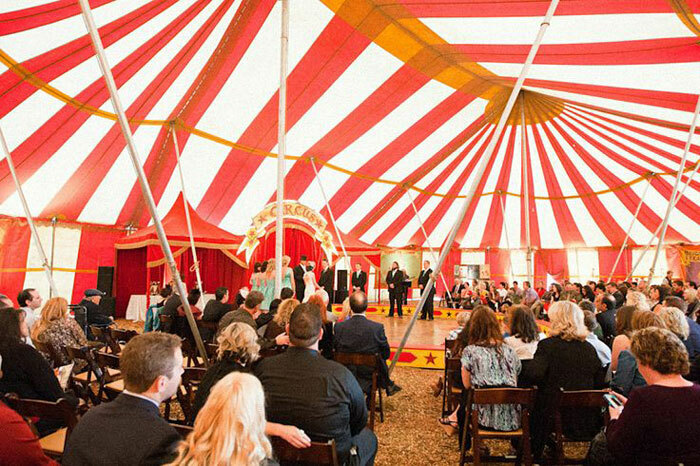 The carnival or circus tent is a pole tent dressed up in red and white striped fabric. 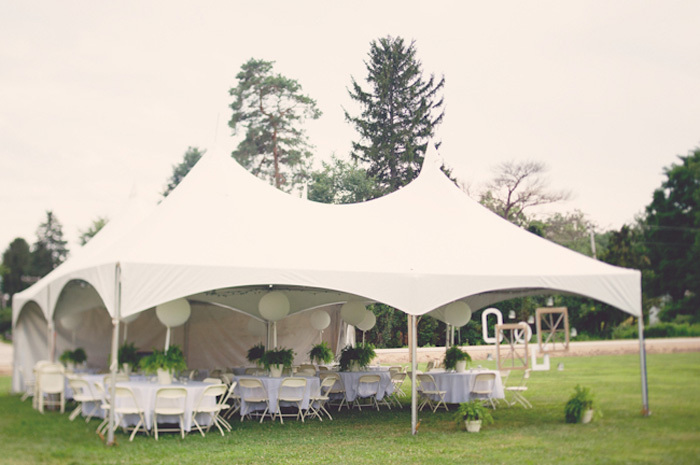 While it is possible to rent this type of tent in certain places, they are usually very large and hard to come by. 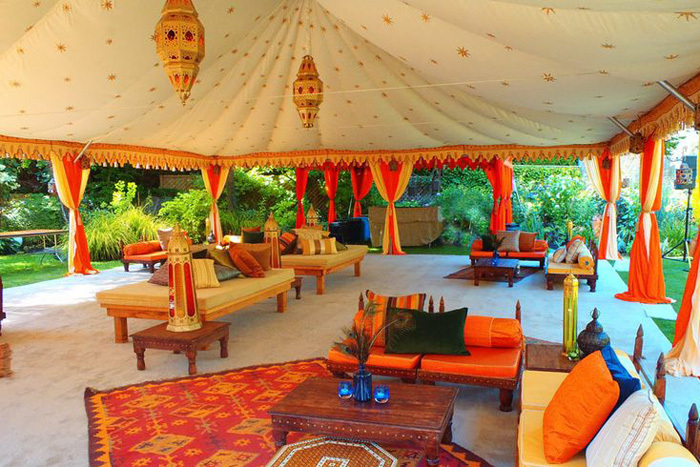 The Moroccan themed tent is usually a marquee or pole style tent adorned in beautiful fabrics and trim instead of white vinyl. 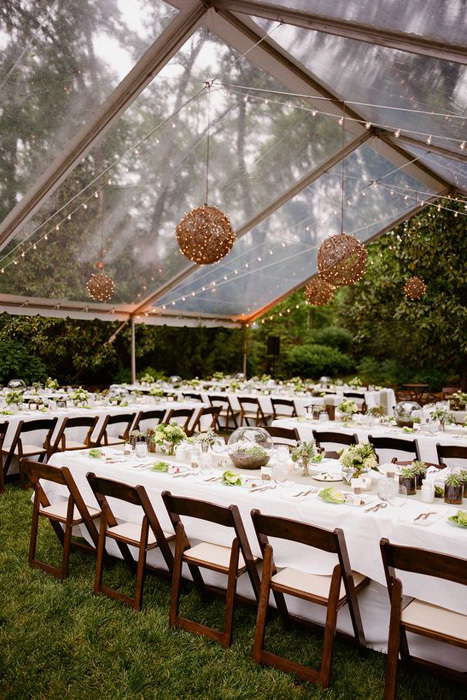 These types of tents are only available to rent from select rental companies and additional draping, lighting and decor are usually available to complete the look. 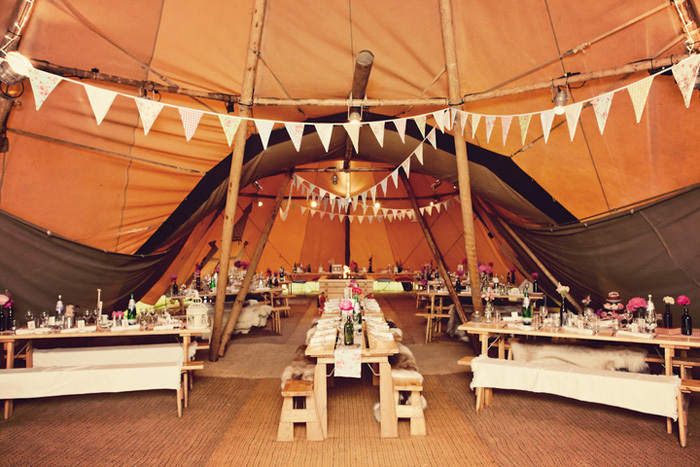 Styled after Nordic Sami kata and the Native American teepee, the teepee tent offers a unique shape, cozy environment, and interesting look to your event. They come in a variety of sizes and configurations making them suitable for both large and small weddings. Like the pole tent and sailcloth tent, their beautiful aesthetic comes at the cost of added obstacles due to the poles that support them. 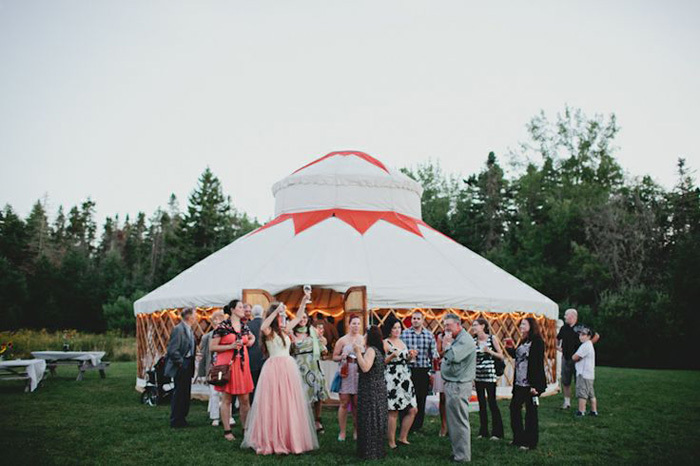 Traditionally used as a portable dwelling, the yurt has recently been gaining in popularity, particularly in Canada and England, as a wedding/event tent. 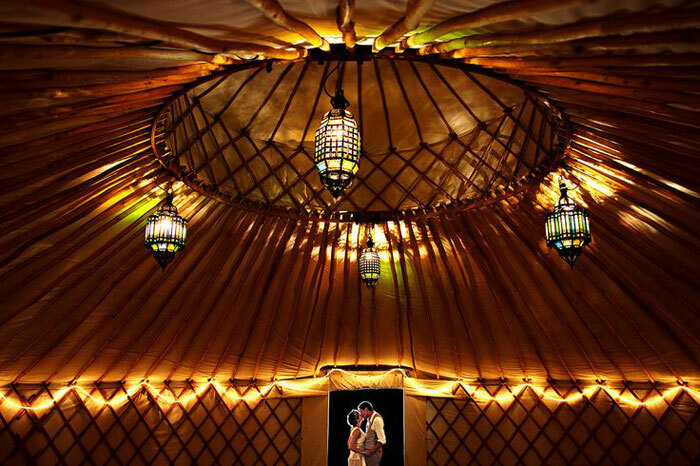 Lattice walls and a wood ribbed roof and crown, all covered in fabric, make up the structure of the yurt. Due to their relatively small size, they are not suited to large weddings, but they are perfect for more intimate and cozy affairs.